Do you know any Greenway Turkeys? May is National Bike Safety Month, so in honor of this holiday here are a few tips and tricks from the Utah Bicycle Lawyers to keep you riding safe this season. Do you Have the Right Life Jacket? Does your trail need a bridge? Would you like to connect your trail with the region’s heritage? Do you believe in the value of recycling and re-use? The Susquehanna Sojourns are guided paddling experiences that celebrate the Susquehanna as PA's "River of the Year" in 2016! Our river needs you! Spring cleanups are being planned all along the Susquehanna River and smaller tributaries. Get involved by planning a cleanup or volunteering at an event near you. January 2016, reprinted with permission from Muncy Historical Society. Get ready to vote for your favorite river, the Susquehanna, in the 2016 Pennsylvania Organization for Watersheds and Rivers (POWR) River of the Year contest! 36 Acres Conserved Along The River! The last operating ferry boats across the Susquehanna River have a new way to tell their unique stories thanks to new interpretive signage at the Ferry Landing in Riverfront Park, Millersburg, PA.
We're excited to share our 2014 Progress Report which highlights our many accomplishments, partnerships, and activities from this past year. Where do you think walking and biking improvements are needed in your town? How Do We Improve Bloomsburg Town Park? How does your Greenway grow? By connecting and greening trails, parks, neighborhoods, and towns along the Susquehanna River! Rain Gardens & Plantings for Jersey Shore! New partnerships and exciting projects are sprouting along the West Branch in Jersey Shore, PA. The arts will have a new home along the river when the Susquehanna Art Museum officially opens to the public on Friday, January 16, 2015 in midtown Harrisburg. Admission is free on opening day. New River Walkway for Lancaster County! Use Your Outdoor Voice for Greenways & Trails! Do you think outdoor recreation plays a vital role in creating healthy citizens and communities? We sure do! Cleaner water will be entering the West Branch of the Susquehanna River thanks to a new, unique treatment system unveiled near Clearfield Creek in Clearfield County. Where are walking and biking trails or connections needed? Where do you experience "problem" areas for speeding, traffic congestion, or unsafe pedestrian crossing? Once again our judges were blown away by the amazing stories and moments shared in our 4th annual Susquehanna Greenway Photo Contest. Attention Students - River Researchers Camp! The River Researchers Teen Camp is a seven-day camp hosted by Trout Unlimited's Eastern Abandonend Mine Program. Camp will be held June 22-28, 2014 at Camp Mountain Run in Penfield, Pa.
Save The Dates: Susquehanna Sojourns! Where Do We Need River Access? Where do we need boat ramps or fishing piers? Places to swim, or bird watch? New River Access for West Branch! Pennsylvanians are being asked to nominate their favorite trail for the 2014 Trail of the Year, Department of Conservation and Natural Resources Acting Secretary Ellen Ferretti announced today. The dream of leaving an older home and finding something "built to suit" in a new development is a thought that often occurs to homeowners looking for more space and less upkeep. Great PA Cleanup - Register! Have a great story of trail or greenway development success? The PA Trout Unlimited is now accepting applications for its 2013 Trout in the Classroom Grants for the 2013-2014 school year. Applications are due March 30. Do you think that state funds dedicated to preserving farmland and open space, providing parks and trails, and protecting rivers and streams should continue to be used for these purposes? What do you want to be when you grow up? A Forester? A Geologist? A Park Manager? 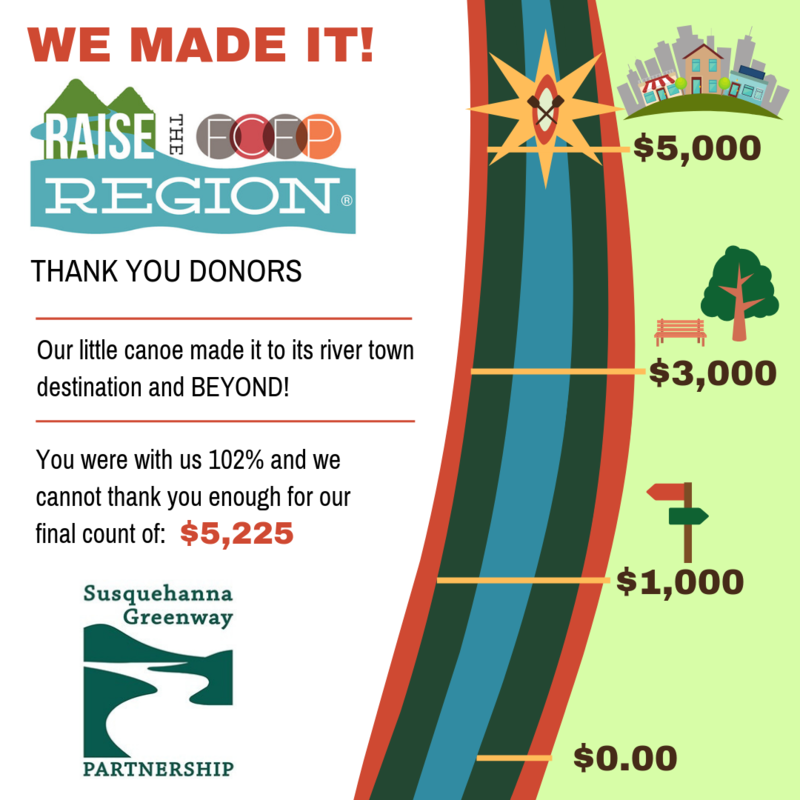 Each month learn about a local project being funded through the Susquehanna Greenway Partnership that is helping to build the Greenway and connect people to the Susquehanna River. Department of Conservation and Natural Resources: Study shows Pennsylvania water trails support local economies, jobs. Cleaner water will be entering the West Branch of the Susquehanna River thanks to a new treatment system unveiled in the Morgan Run watershed in Clearfield County. We are seeking a student intern to assist with our Corporate Campaign during Fall 2012 semester at our Lewisburg, PA offices. Who is your Chesapeake forest champion? to outstanding efforts to conserve, restore, and celebrate Chesapeake forests in 2012? Millersburg's Riverfront Park recently unveiled an asphalt hiking/biking pathway along the length of the park which will connect to the future Lykens Valley Rail Trail. Manor Township along the Lower Susquehanna River in Lancaster County is developing a 6-mile riverside rail-trail thanks to a great partnership with Norfolk Southern and PA Department of Conservation and Natural Resources! This article was featured in our April 2012 newsletter. Break out the paddles and get your campfire tales organized! Plans are in the works for a 6 day educational canoe/kayak trip along some of the most remote and lovely sections of the West Branch of the Susquehanna River! million gallons of highly acidic water, or Acid Mine Drainage (AMD), daily from an old coal mine in Cambria County. This article was featured in our February 2012 newsletter. National Geographic Highlights West Branch! Danville's rich river history is now on display, as three new interpretive panels have been installed in three different community park spaces! Researchers on the River - Carlos Iudica, Ph.D.